Malala Yousafzai recovering in an English hospital. 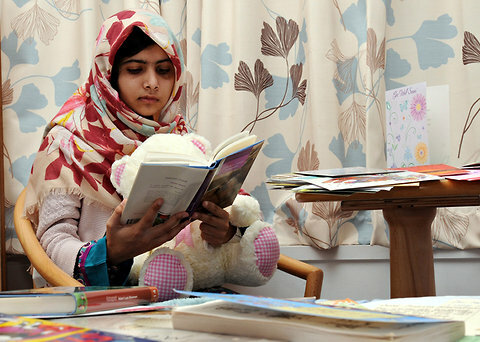 Malala Yousafzai, 15, is sitting up and reading at a hospital in England. She is recovering from being shot in her native Pakistan last month after the Taliban targeted her as a threat simply because she wants an education. Yousafzai is a young advocate for girls' education in her homeland. She became known as "The Anne Frank of Pakistan" after the BBC aired a series of her video diaries chronicling her activism. appalling (although the gender difference is smaller): the net enrolment (sic) rate for girls is just 29%. Altogether, more than 8 million girls of school age (primary and secondary) are not in school." 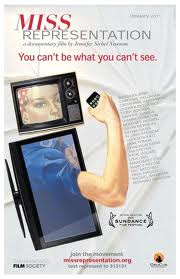 restricted because of their families’ fear of violence whilst traveling." subordinate status of women which society seeks to preserve include domestic violence; sexual violence; traditional harmful practices including female genital mutilation, honor killing and dowry-related violence; and human trafficking." The report also notes that "strict family, tribal and religious customs (that have) become cultural norms" also play a role. 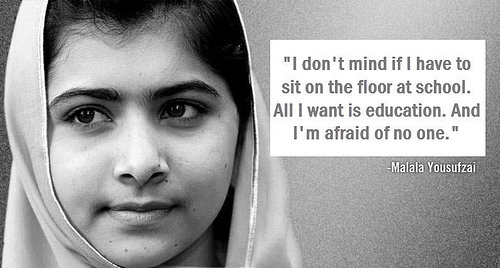 The shooting of Malala Yousafzai is certainly an illustration of patriarchy at its ugliest. Today, the United Nations General Secretary Ban Ki-Moon and former British prime minister Gordon Brown, the UN's special envoy fo reducation, have called for a Global Day of Action in honor of Malals Yousafzai and ask that you share her story with friends and family. The right to education is a social, cultural, civil and political right not to be taken for granted. Read the report, "Gender Discrimination in Education: The violation of rights of women and girls"